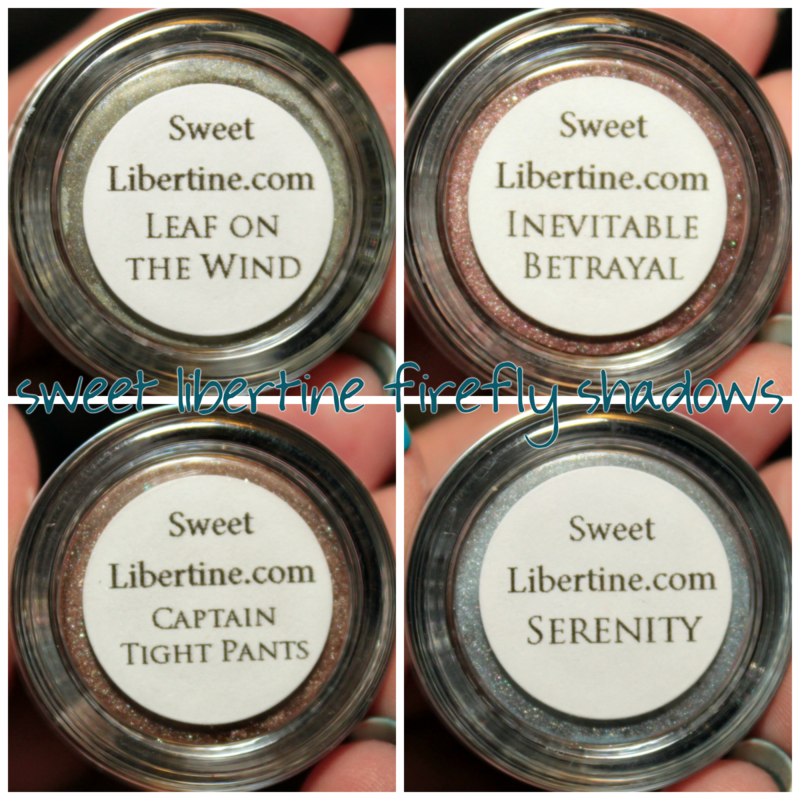 Sweet Libertine Mineral Cosmetics eyeshadows - Four from the Firefly collection! Sweet Libertine, Sweet Libertine. I'm so very glad I found you! haha I am seriously all about mineral eyeshadows lately. 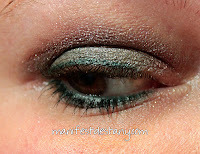 I've told you before about my love for FEVERshadow loose pigments, and how long-lasting they are. Well, we can add Sweet Libertine to that mix, as well! 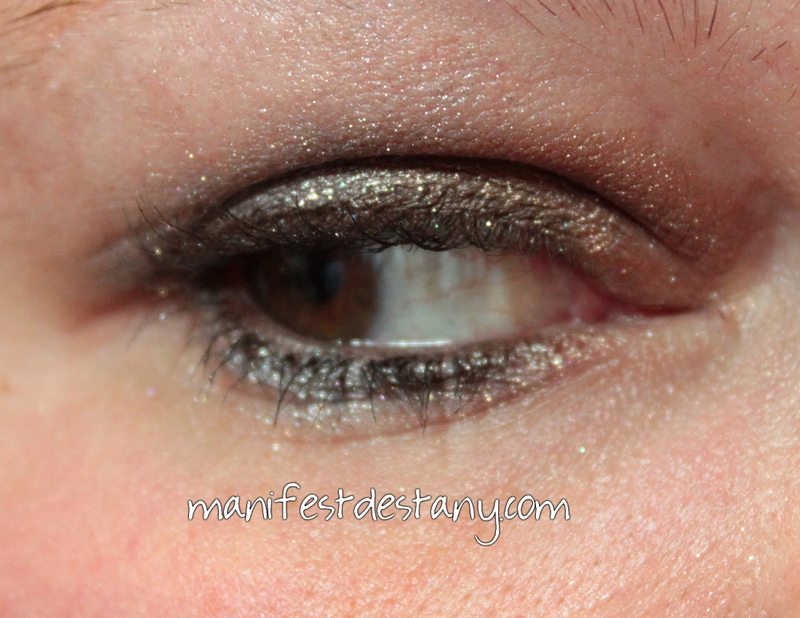 The more I learn about makeup (dang, I always have to remind myself I started from the nail polish side of things), the more I adore mineral eyeshadows. Let me just say, though, that I'm still learning. I don't think my eyelooks are all that great, and I'm not a wiz at applying makeup. I posted some teasers on Instagram last night of the two eyelooks I would be featuring today :) I have four shadows from the Sweet Libertine Firefly collection. I just love the names! 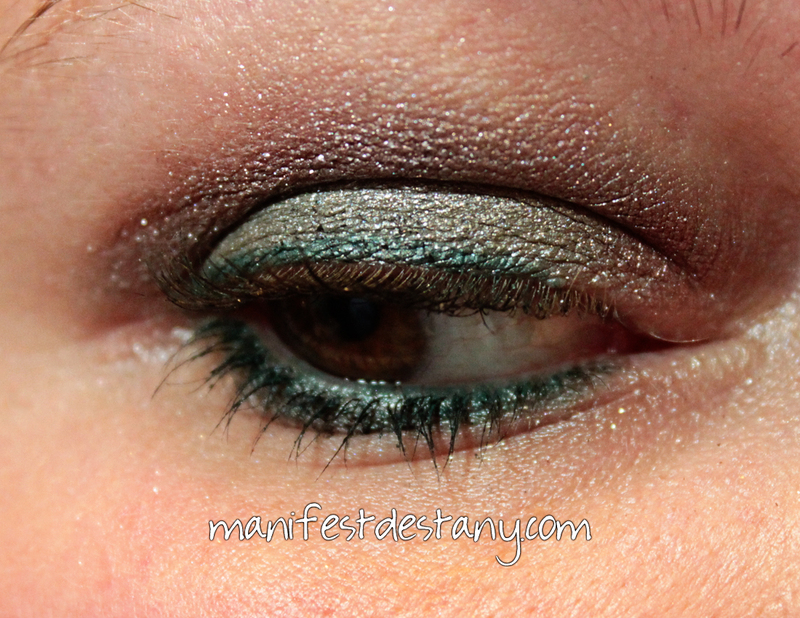 But more importantly, I don't have a lot of pigments in these shades, so bonus. I had to break out my Firefly t-shirt for this :) Yeah, I'm one of those nerds :) This shirt was also featured back when I got the Nerd Lacquer Serenity Collection. Ok, ok, enough nerd-dom. Let's move on to the shadows. 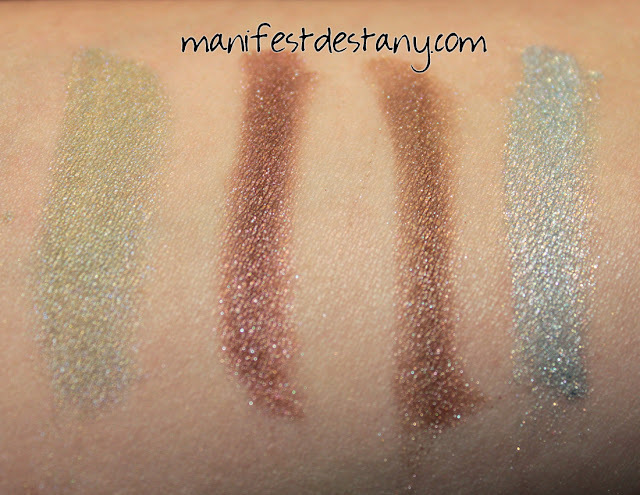 From left to right, here are arm swatches of Leaf on the Wind, Inevitable Betrayal, Captain Tightpants and Serenity. 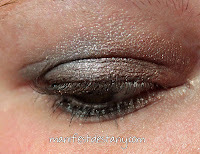 The pigmentation on the two brown-toned shadows is much deeper than on the green and blue one. Serenity, the blue-ish one, is the lightest pigmented of all four, and really acted as more of a dusting for me in my eyelooks...and what were they? The first look used Leaf on the Wind and Inevitable Betrayal. 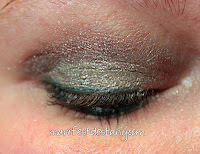 I used those together because of Wash *sniffle* I started with Jesse's Girl Eye Primer (always my go-to), then used a white Sephora eyeshadow pencil as the base for my lid. I then covered my lid with Leaf on the Wind. I feathered upward with Inevitable Betrayal, but didn't bring it all the way up to my eyebrow. And speaking of eyebrows, mine look hideous right now! I have to go get them taken care of pronto! 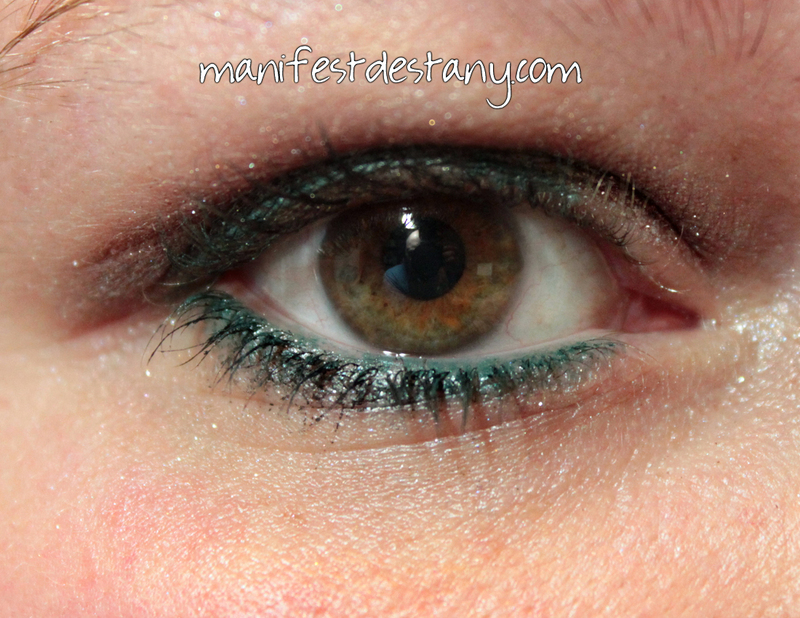 I used a green Wet n Wild eyeliner and my WnW black mascara. The second look features Captain Tightpants and Serenity. These two colors together are a very understated duo. I started with Jesse's Girl Eye Primer, and then dashed Captain Tightpants across the inside of my lid and up a little ways toward my eyebrow (but not going all the way up to the eyebrow). I used Serenity on the outside of the lid and mimicked what I did with the brown. I added a brown Wet n Wild eyeliner to my waterline and upper lashline and then used Serenity along my lower lashline. I finished with my WnW black mascara. And now for the best part - the Firefly collection is STILL available from Sweet Libertine! Until the end of this month, you can order the whole collection of 18 shadows for $120. You can also purchase individually for $7 per shadow. ALSO as a "wrap-up" for this collection, there is a Serenity collection! Get it - cause Serenity wrapped-up Firefly? haha! I love it! :) Anyway, this 6-piece shadow collection is on sale now, as well. I've already snagged two of them for myself - INCLUDING ONE THAT IS NAMED THE NAME I SUGGESTED! Anyway hehe you can get the Serenity collection for $40 - OR both collections (check 24 shadows!) for $140.